The Bhil tribals have a tradition of cooperation in cultural economic and social spheres. The greatest thing about them is that they have communitarian system of entertainment linked to their livelihoods and their religion. In the celebration of the Indal a family gives a feast to the community in which it expends all its surpluses. The whole community gathers together to celebrate in song and dance and offer praise to the God Kansari who is the symbolic representation of the staple cereal sorghum. In this way surpluses are not accumulated and the egalitarian nature of the Bhil society is maintained. However, with the advent of the market economy and the penetration of populist entertainment through videos this culture is decaying. The Dhas Gramin Vikas Kendra has tried its best to revive and rejuvenate the traditional cultural forms. There is a community form of the Indal festival. 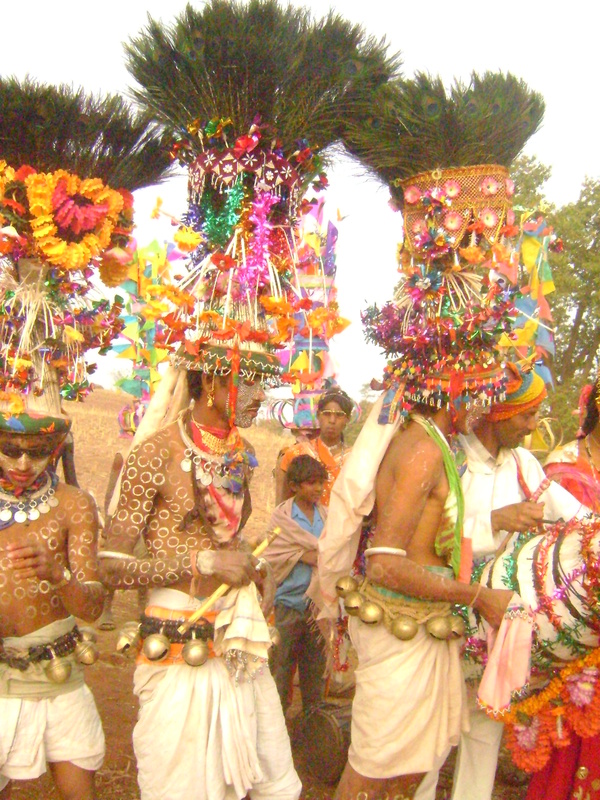 With the increasing poverty of the tribals the individual Indal festival has become a rarity. So the DGVK has mobilised people to get together to celebrate the gaon gondlia indal or community Indal. Moreover the orally recited epics of the Bhils or gayanas have been recorded and transcribed and are in the process of being published. In this way even if the traditional bards slowly pass away their epics will still remain. These epics and their songs are used creatively to create new songs that are a major attraction of the political movement for rights. Songs have been composed encouraging people to save the forests and their land and water. The Khedut Mazdoor Chetna Sangath also organises a jungle mela or forest fair in which traditional culture and traditional tribal economy are highlighted. The DGVK and KMCS recognised the importance of networking for small organisations very early on. The DGVK initiated a process of bringing together like minded NGOs in Jhabua and Alirajpur districts as early as 1991 under the federation “Jhabua Jodo” or unite Jhabua. The intention was to create a forum in which NGOs could discuss their problems and also launch common programmes. This federation was very successful and is active even to this day. Many new social workers were enthused to set up NGOs and begin working for the betterment of the livelihoods of the Bhil tribals. The KMCS has been even more active in networking because that is the only way in which rights based actions can be made fruitful in the face of opposition from vested interests in society and the government. The KMCS collaborated with the Narmada Bachao Andolan from 1985 onwards to fight for the rights of the oustees of the Sardar Sarovar dam being built on the River Narmada and that collaboration continues to this day. In 1988 the KMCS initiated the process of bringing together all the various rights based mass organisations of western Madhya Pradesh under the federation Jan Mukti Morcha. Public rallies and workshops were conduced under the aegis of the Jan Mukti Morcha so as to build up a wider organisation. Later the KMCS joined the even larger federation Adivasi Ekta Parishad (AEP) in 1994. The AEP is a federation of tribal rights organisations in the four states of Maharashtra, Gujarat, Madhya Pradesh and Rajasthan and has a mass base of lakhs of tribals. The KMCS has organised big demonstrations and public meetings under the banner of AEP in Alirajpur and Jhabua districts. The KMCS has also aligned itself with international organisations for the rights of tribals like the Survival International. Thus networking has been used effectively to enhance the impact of the work being done. Finally the KMCS has also promoted other tribal rights organisations in the region to broaden the mass base of rights actions. Activists from the organisation went to Dewas and Khargone districts in 1995 to set up the Adivasi Morcha Sangathatn and Adivasi Shakti Sangathan respectively. A separate organisation called Kansari Nu Vadavno was set up to fight exclusively for the reproductive health and rights of Bhil tribal women. Given the integral part that music and dance play in the lifestyles of the Bhil tribals no process of mass mobilisation can be successful without incorporating these into the overall strategy. The KMCS has from the beginning used the traditional song couplets and even the longer epic gayanas to convey messages inspiring the people to struggle for their rights. The nature friendly lyrics of the traditional songs have helped in propagating a message of natural resource conservation. In fact a separate organisation named the Adivasi Riti Badhao Tola or Forum for the Promotion of Adivasi Culture has been formed and it has as its aim – the formulation of a new framework for adivasi cultural renewal as a tool for their socio-economic development that can not only rejuvenate the living conditions of the Bhils but can be gainfully replicated for the development of other adivasi cultures in the short run and for the reform of non-adivasi cultures in the long run.